Honorary degrees were conferred to Marcus by the University of Chicago in 1983, by the University of Goteborg in 1986, by the Polytechnic Institute of Brooklyn in 1987, by McGill in 1988, by Queen's University in 1993, by the University of New Brunswick also in 1993 and by the University of Hyderabad, in India, which conferred the degree of Doctor of Science in 2012. 1 2 "Professor Rudolph Marcus ForMemRS". London: Royal Society. Archived from the original on 2015-10-10. 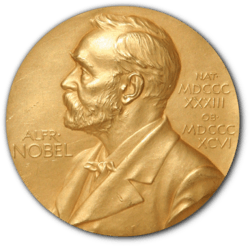 ↑ "The Nobel Prize in Chemistry 1992". Nobelprize.org. Retrieved 2013-08-01. ↑ Bohning, James J. (June 20, 1991). "Transcript of Interview with Rudolph A. Marcus" (PDF). Center for Oral History. Chemical Heritage Foundation. ↑ "Rudolph A. Marcus - Facts". Nobelprize.org. 1923-07-21. Retrieved 2013-08-01. ↑ Bohning, James J. (June 20, 1991). "Interview with Rudolph A. Marcus". Center for Oral History. Chemical Heritage Foundation. ↑ "Rudolph A. Marcus (Canadian-American chemist) - Encyclopedia Britannica". Britannica.com. 1923-07-21. Retrieved 2013-08-01. ↑ "FACULTY ::: Division of Chemistry and Chemical Engineering ::: CALTECH". Cce.caltech.edu. Retrieved 2013-08-01. ↑ "Rudolph A. Marcus". The President's National Medal of Science: Recipient Details. National Science Foundation. Retrieved 26 November 2013. 1 2 "Rudolph Marcus". Jewishvirtuallibrary.org. 1923-07-21. Retrieved 2013-08-01. ↑ "Rudolph A. Marcus - Biographical". Nobelprize.org. Retrieved 2013-08-01.